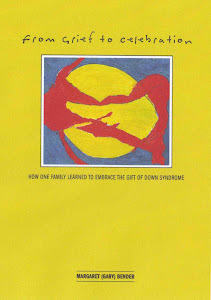 I inadvertently left the NADS presentation about about health and wellness for adults with down syndrome at my office and have had to switch my today post plan from myths about adults with DS to meet Alex.....assuming anyone has paid any attention to my stay tuned topics at the end of every post. And I promise you these myths are FUNNY. This was recorded two years ago after Alex returned from competing in the 2010 National Special Olympic Games in Lincoln, NE. It was videoed by our good friend Darlene who lives in Crested Butte, and has been president of the Alex fan club for a number of years. It was nice for me to review this video and notice all the changes in Alex over the last two years. For example, she does not touch her face and hair as often, although I am sure this can be attributed to nervousness. Her hair is shorter and styled and she has even agreed to get her brows professionally waxed every month. After all she is 19! What I love about this video though, Alex's humor comes through as she warms up and her love of life is apparent. 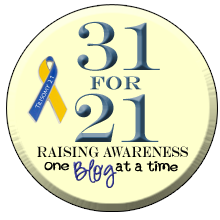 Check out these other great 31 for 21 blogs on blog hop Friday! LOVE LOVE LOVE! Go Alex!